Now, wreaths can be costly. I don’t know about you, but I am so not down with buying a wreath that I can’t transition into another season (unless, of course, it’s a longer decorating season like Christmas). Then it’s worth the dollar (to me). And I’m also not about to pay top dollar for a wreath to dismantle it. So how exactly do you make a captivating wreath that’s love inspired but transitional to spring after Valentine’s Day? Themes are good, but keeping colors neutral is the best way to transition from Valentine’s Day. Start with your greenery and choose your embellishments according to what your personal decor style is. Give yourself some room in your design to add, change or even move the piece around. A Valentine’s Day wreath can show variety and creativity. You’re not limited. Let’s look at some popular choices. Valentine’s Day usually involves chocolates and flowers. So it’s totally appropriate to create a flowery wreath and incorporate hints of chocolate color. It’s a perfect fit and completely transitions into spring. The chocolate in this wreath comes from the deep brown vine wreath. Paired with the bright flowers, this makes a beautiful option that can transition into the spring months. artificial berries for a fruity change. For a more simplistic and laidback Valentine’s Day wreath, burlap never grows old. A cute burlap wreath with a red, pink or even a white bow makes a really pretty statement for Valentine’s Day, and it’s so stinking easy to pop off that bow ad add something in its place. Burlap V-Day wreaths are also easy enough for a last-minute DIY project. Catch the link below for this one. Making a more elaborate wreath is always an option, if that’s your style. 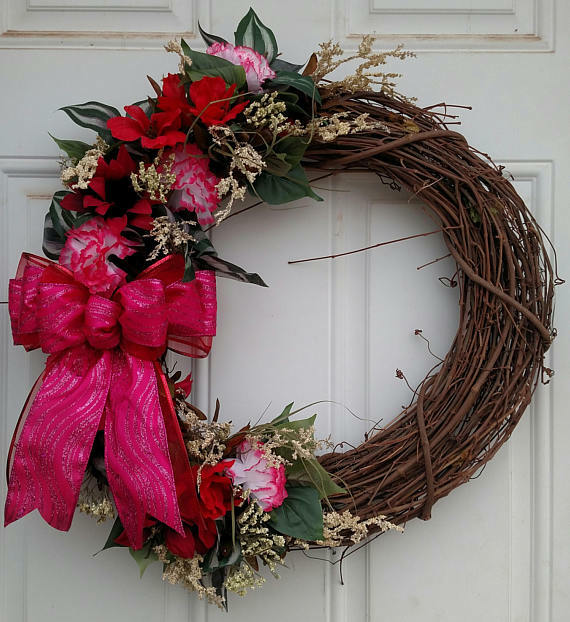 The more florals you include, the more elaborate (and romantic) your can make your wreath. You can shell out cash if you want, but most of these wreaths are simple to make and only require your choice of flowers, greenery and a little hot glue. And I should probably mention, the trick to removing some of these pieces from a wreath is to not overdo the hot glue. Just a little hot glue will keep the flowers in place while making them easy to remove for restyling for the next holiday or season. Here’s are a few versatile, wreaths that aren’t exactly DIY, but they’re great for giving a few ideas for creating one that’s versatile enough to go straight into spring. For Valentine’s Day, you can easily add a pink bow for that pop of color and remove it when it’s over to take it into spring. Artificial Green Wreath see here. Keeping the meaning of the wreath always seems to add more value to using one to me. I love the thought of taking an old tradition and adding a new twist (that doesn’t detract from the meaning). This quote is just one reminder of how we can use the wreath in our every day decor and as the symbol of eternity as well. What wreath will you hang for this season? Comment below. I’d love to hear.